Cascade by Matchbox: Design Genius or Eccentric Lunacy? I read today to read of the death of Andre Cassagnes, the inventor of Etch A Sketch, aged 86. This is sad news, but one things led to another and I ended up reading about the top 23 children’s games from the 1950s to the present. I don’t know why they chose 23 but there you go. 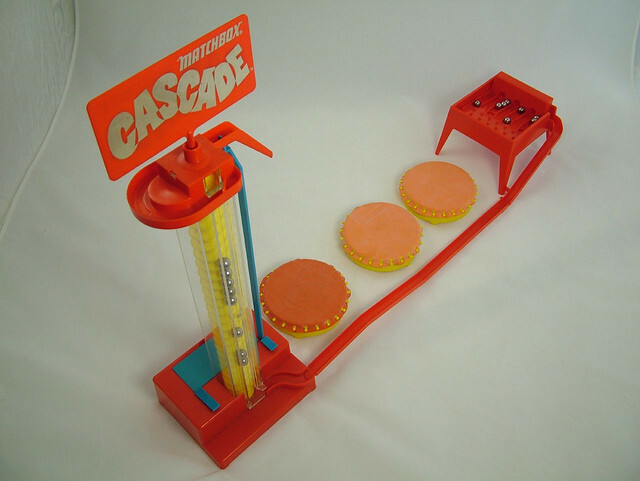 One “game” if it is possible to call it that was the undoubtedly quirky Cascade by Matchbox. This was a game from the 1970s I had, and I don’t recall any other friends who had it. In fact, I don’t remember playing it with any friends, but as a bit of a nerby kid, it kept me occupied for a long time. There was a plastic mat, and on the plastic mat you built the infrastructure. This was a tower, three bouncy mats, the landing pad and an open pipe to channel the many marbles back to the tower. The idea was that the marbles would rise up the tower which had a corkscrew inside the clear perspex sides. 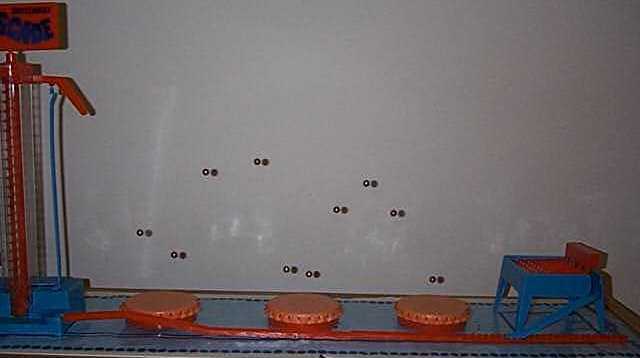 The marbles would then roll off the top, bounce over the trampolines and land in the landing block, whereupon the marbles would be caught in various channels and score points, or continue to roll through holes in the back to return to the tower again. 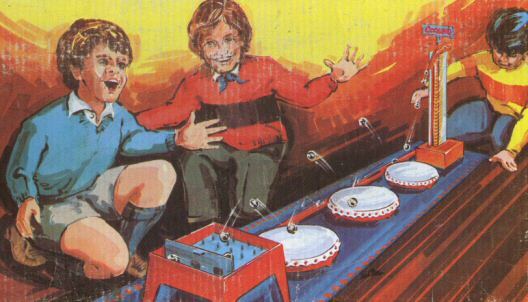 Although the picture on the box promised scintillating excitement, it always seemed to me that where ever you places the trampolines, the balls never quite made it to the very end. This chap though in this photo seems to have had more luck than me. It was indeed a strange game. As I recall, mine finally met its demise when I took the tower apart, to examine the motor inside. 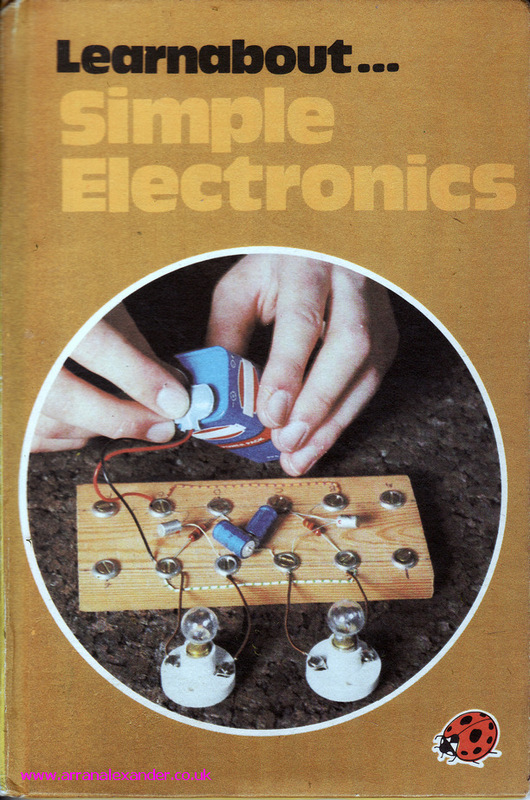 At the age of 8 I was given batteries and things to play with, and had the Ladybird book of electronics to tell me how to build basic circuits, one of which you can see on the cover of the book below. So that was me at the age of 8. It was weird today as in a beauty salon I was in, there was a girl the same age having a manicure. She then finished a became engrossed in her iPad. I see other kids the same age playing with their £400 or more iPads around our condominium. Other things I did at that age were getting very dirty in the countryside, and as well as having a chemistry kit my mother also bought me a jar of methylated spirits to play with, which in theory was meant to fuel the bunsen burner. No harm came to me and I am now the well adjusted adult you all know and love. We have seen great developments in games, mainly in the electronics department, from Pong to Atari to the Commodore and ZX Spectrum, to Playstation to what we have today. But have the physical games seen the same advances in development?